Located in and around Military City, USA, the Lone Star Chapter serves and unites surviving spouses who live around San Antonio, Austin, New Braunfels, the Texas Hill Country, and surrounding counties. However, we welcome virtual membership from any GSW Member-At-Large who would like to be affiliated with our chapter. 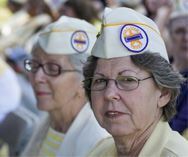 Our chapter consists of Gold Star Wives from World War II, Korea, Vietnam, Desert Storm, Iraq and Afghanistan, as well as survivors of Active Duty and Retired disabled veterans. We are active in our community through a wide range of activities. We work closely with Survivor Outreach Services at Joint Base San Antonio – Fort Sam Houston, Fort Sam Houston National Cemetery, the Fisher House, and much more. We also aggressively pursue legislation in the state of Texas that benefits Surviving spouses and their children. Our members are active participants in the national organization of GSW, and serve on the board of directors and as national officers. We encourage all members to take ownership of our chapter and to participate as much as possible. Our meetings are currently held on the second Saturday of every month at 10 a.m. however, our new board is seeking other possible venues with your help! To learn more about our chapter, to become a member, serve on the board, or donate to our cause, please email our Chapter President, Karen Riecke, or Chapter Vice President, Cindy Hildner. You can also contact the national office by phone at 1-888-751-6350. We look forward to your active participation in GSW! We look forward to seeing and hearing from all y’all!